I saw this truth on a church sign in Florida yesterday. 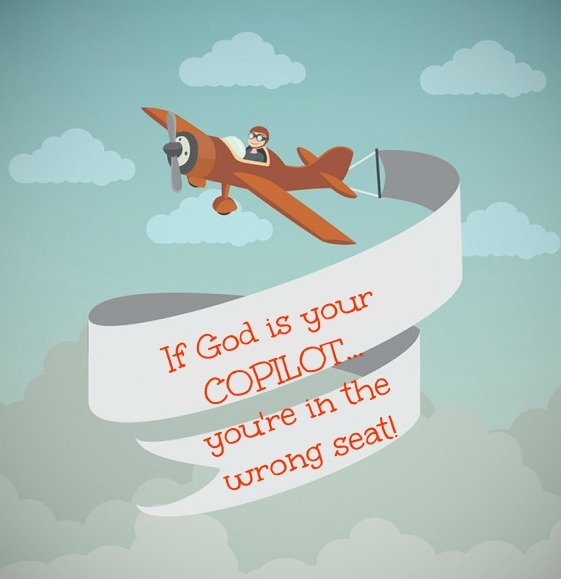 For years, folks used bumper stickers to communicate the thought "God is my copilot". In all sincerity, this is the correct thought "God is my pilot". Any idea how things have gotten turned upside down in our country? We must allow God to be the driver in our life, not a passenger along for the ride. Life is like an airplane ride. 1. You take off. / I equate this to spiritual morality and understanding you're a sinner. 2. Reach the perfect flying altitude. / Spiritually when you accept Christ. 3. Land safely when your journey is over. / Enter into perfect rest in heaven. The "flight" is your life journey. Some flights are long, some are short. Your flight may be turbulent and even smooth at times. If the cabin loses pressure, you'll need oxygen to survive. Just like when you sin against God, you need forgiveness to survive! During your flight, you have no control other than to trust your pilot. This example shows how we should trust Jesus, completely, relinquishing our life to him. "We are now boarding rows 17-34." "Boarding all rows all seats." You have an assigned seat. Be sure you're in it!